This is special to the Mirror by Khyber Little. 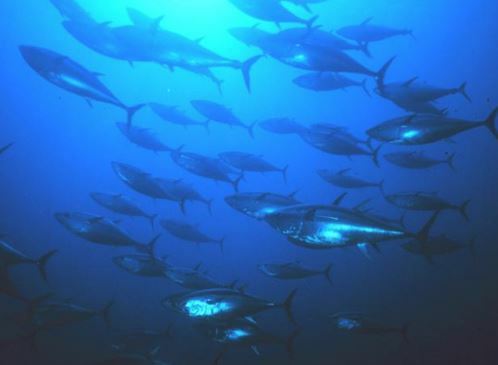 Unfortunately for the dolphins, in the early 1960s, tuna fishers began switching their fishing method from pole, hook, and line to much more efficient large nets that enabled fishers to catch many tons of tuna at one time. Speed boats chase down the dolphins, herd them together, and encircle the net around them. During this process, tuna stay with the dolphins and the two are captured together. These are called purse seine nets because the net is closed—like closing a purse—on the dolphins and tuna. From the mid-1960s to the mid-1970s, tens to hundreds of thousands of dolphins drowned each year when caught in the nets. Subsequently, their carcasses were thrown into the ocean as wasted bycatch. When this practice was brought to public attention in the early 1970s, purse seine nets were modified so that most dolphins were able to escape before the nets were pulled onboard the fishing vessel. A portion of the net is lowered underwater allowing the dolphins to escape. This modification greatly reduced the dolphin bycatch, especially in the eastern tropical Pacific where today more than 99% of captured dolphins are released alive. Source: Moran, J. M. (2018) Ocean Studies: Introduction to Oceanography (4th ed). American Meteorological Society.